Ag encounter in the absence of proliferation results in the establishment of T cell unresponsiveness, also known as T cell clonal anergy. Anergic T cells fail to proliferate upon restimulation because of the inability to produce IL-2 and to properly regulate the G1 cell cycle checkpoint. Because optimal TCR and CD28 engagement can elicit IL-2-independent cell cycle progression, we investigated whether CD3/CD28-mediated activation of anergic T cells could overcome G1 cell cycle block, drive T cell proliferation, and thus reverse clonal anergy. We show here that although antigenic stimulation fails to elicit G1-to-S transition, anti-CD3/CD28 mAbs allow proper cell cycle progression and proliferation of anergic T cells. However, CD3/CD28-mediated cell division does not restore Ag responsiveness. Our data instead indicate that reversal of clonal anergy specifically requires an IL-2-dependent, rapamycin-sensitive signal, which is delivered independently of cell proliferation. Thus, by tracing proliferation and Ag responsiveness of individual cells, we show that whereas both TCR/CD28 and IL-2-generated signals can drive T cell proliferation, only IL-2/IL-2R interaction regulates Ag responsiveness, indicating that proliferation and clonal anergy can be independently regulated. A tight control of T cell proliferation is required for the maintenance of a correct balance between immunity against foreign pathogens and tolerance against normal tissues. Indeed, whereas the expansion of pathogen-specific lymphocytes must be rapidly elicited to guarantee the development of protective immune responses, proliferation of potentially self-reactive T cells must be limited to prevent the establishment of unwanted autoimmune diseases. Proliferation of T lymphocytes requires the coordinate engagement of a number of cell surface receptors. The first critical event is the simultaneous occupancy of the Ag-specific TCR and of the CD28 costimulatory receptor. This generates several intracellular signals required for IL-2 gene transcription and protein production and for cell surface expression of the IL-2R. The second critical event requires the interaction of autocrine IL-2 with its newly expressed surface receptor. This ultimately results in T cell proliferation. If T cells fail to progress through the cell cycle and to proliferate on Ag encounter, they become unresponsive to subsequent restimulation. Understanding how proliferation and Ag responsiveness are regulated in T lymphocytes is critical for the development of proper treatments for a number of clinical conditions, such as autoimmune diseases, organ transplantation, and tumors; thus, these issues have been extensively investigated over the past years. Jenkins et al. (1, 2) first showed that suboptimal T cell activation, provided by chemically fixed Ag-bearing APC or by immobilized anti-CD3 mAb, fails to elicit T cell proliferation and instead hampers the ability of the cells to produce IL-2 and to proliferate on subsequent optimal restimulation. This state of lymphocyte unresponsiveness has been defined as clonal anergy (3, 4, 5). The establishment of clonal anergy requires TCR-generated signaling and new protein synthesis, because it can be inhibited if cyclosporin A and cycloheximide are provided at the time of TCR occupancy (2, 6, 7). It was later shown that clonal anergy could also be induced in the presence of optimal T cell activation by preventing IL-2-IL-2R interaction (8) or IL-2-dependent T cell proliferation (9). Sloan-Lancaster et al. (10) similarly reported that partial agonists, which signal through the TCR but do not cause proliferation despite the presence of CD28 costimulation, failed to lead to T cell proliferation and instead induced clonal anergy. Similarly, inhibition of G1-to-S transition by the addition of n-butyrate (11) or rapamycin (12) at the time of stimulation impairs the ability of T cells to respond to subsequent stimulation. By contrast, the addition of exogenous IL-2 to suboptimally stimulated T cells or to anergic T cells drives extensive T cell proliferation and elicits reversal of clonal anergy (9, 13). These data support the view that TCR occupancy normally results in the production of negative regulatory factors, which are then degraded or inhibited during IL-2-driven G1-to-S phase transition. This model predicts that in the absence of G1-to-S transition or proliferation the anergic factors might accumulate inside the cells and inhibit subsequent T cell responses (9, 14). Even though the nature of the putative anergic factors remains controversial, it has been postulated that their activity could be directly linked to the regulation of G1-to-S phase transition. For instance, a number of reports have indicated the G1 cyclin-dependent kinase inhibitor p27Kip as a putative anergic factor, because its deregulated expression directly correlates with T cell responsiveness (15, 16). Indeed, suboptimal stimulation with costimulatory deficient APC, which results in T cell anergy, fails to down-regulate p27Kip and elicits cell cycle arrest in early G1 (15). Moreover, overexpression of p27Kip not only prevents G1-to-S transition upon optimal stimulation (16) but also inhibits IL-2 transcription (15). Altogether, the existing information suggest that proper regulation of p27Kip, and more generally of the G1 cell cycle checkpoint, might simultaneously regulate proliferation and clonal anergy in T cells and that forcing G1-to-S transition could be exploited to break T cell anergy and restore Ag responsiveness. Whereas entry of resting lymphocytes into G1 is regulated by TCR-generated intracellular signals (17), G1-to-S phase transition has been described to depend on IL-2-IL-2R-mediated signaling (18, 19, 20). More recently, several reports indicated that IL-2-independent T lymphocyte proliferation occurs both in vivo (21, 22, 23) and in vitro (24, 25, 26). Furthermore, optimal engagement of the TCR and of CD28 has been shown to drive IL-2 independent cyclin/cdks activation and p27Kip degradation (24, 27, 28). We thus set out to investigate whether optimal engagement of the TCR and of CD28 on the surface of anergic T cells could force cell cycle progression and by doing so elicit reversal of clonal anergy. The results reported here indicate that anti-CD3 and anti-CD28 mAbs are indeed able to overcome G1 cell cycle block in anergic T cells and drive cell proliferation but that this is not sufficient to restore Ag responsiveness. Instead, our results indicate that an IL-2-dependent, rapamycin-sensitive signal, induced independently from IL-2-driven cell proliferation, is specifically required for the reversal of clonal anergy. The A.E7 T cell clone was maintained in RPMI supplemented with 2 mM l-glutamine, 100 mg/ml streptomycin, 100 U/ml penicillin, 20 mg/ml gentamicin, and 50 μM 2-ME (Invitrogen Life Technologies, Milan, Italy), and 5% heat-inactivated FBS (Euroclone, Milan, Italy) at 37°C in a 5% CO2 atmosphere by periodic stimulation with a peptide derived from pigeon cytochrome c (PCC81–1043; Primm, Milan, Italy) and irradiated B10.BR (Harlan, Milan, Italy) splenic APC as previously described (29). The chicken OVA-specific wild-type and IL-2−/− DO11.10 T cell lines were generated by stimulating lymph node cells derived from DO11.10 (30) and DO11.10/IL-2−/− mice (22) with irradiated syngeneic BALB/c splenic APC (Charles River, Calco, Italy) pulsed with the OVA-derived peptide (OVAp323–339; Primm). The cells were restimulated weekly with OVA-pulsed APC and expanded in exogenous rIL-2 (10 IU/ml; Roche, Milan, Italy). All experiments were performed at least 10 days from the last Ag exposure. At this time, the cells appeared to be in the G0-G1 stage of the cell cycle. Where indicated, a fraction of the cells was harvested and rested in fresh medium for 5 days (referred to as “control” T cells). At the same time, a similar number of cells were cultured for 16 h on plate-bound anti-CD3ε mAb (clone 145-2C11; 4 μg/ml) (31), removed from the Ab, and then rested for an additional 5 days in fresh medium (referred to as “anergic” T cells), as previously described (8). Similarly to control T cells, anergic cells appeared to be in the G0-G1 phase of the cell cycle. Thereafter, viable cells were separated on a Lympholyte-M (Cedarlane, Hornby, Ontario, Canada) density gradient and restimulated with increasing amounts of the PCC-derived peptide and irradiated APC, with immobilized anti-CD3 mAb (2 μg/ml) and anti-CD28 mAb (clone 37.51) (5 μg/ml) (32), or with rIL-2 (10 IU/ml). Proliferation of control and anergized A.E7 T cells was performed in 96-well plates (2 × 104 cells/well) by [3H]thymidine incorporation after 72 h of culture as previously described (8). The presence of IL-2 in culture supernatants of activated T cells was determined 24 h after stimulation by capture ELISA as previously described (22). Functional assay was performed in 96-well plates using 1 × 105 cells per well. The ELISA standard curve was generated using recombinant murine IL-2 (BD PharMingen, Milan, Italy), and the level of detection was 1 ng/ml. Control and anergic A.E7 cells were stimulated with Ag (1 μM) and irradiated B10.BR splenocytes (T:APC ratio, 1:4), with immobilized anti-CD3 mAb (2 μg/ml) and anti-CD28 mAb (5 μg/ml), or with rIL-2 (10 IU/ml) in the absence or in the presence of rapamycin (200 nM; Calbiochem, Merck, Milan, Italy). At the end of the stimulation, the cells were either analyzed by flow cytometry or removed from the Abs, rested in fresh medium for 10 days, and then restimulated with Ag/APC. Wild-type and IL-2−/− DO11.10 T cells were stimulated for the indicated periods of time with immobilized anti-CD3 mAb (1 μg/ml) and anti-CD28 mAb (5 μg/ml) or with anti-CD3 mAb (0.1 μg/ml) and rIL-2 (10 IU/ml). Control and stimulated T cells were harvested, washed twice with ice cold PBS, and lysed in lysis buffer (50 mM Tris-HCl (pH 7.4), 0.5% Nonidet P-40, 150 mM NaCl, 100 μg/ml PMSF, 1 μg/ml aprotinin, 1 μg/ml leupeptin, 1 mM PMSF; Sigma-Aldrich, Milan, Italy) for 20 min on ice. The soluble fraction was separated by centrifugation at 13,000 rpm for 15 min at 4°C, and the protein content was determined by the Bradford assay (Bio-Rad, Milan, Italy). Samples containing an equal amount of proteins were mixed with an equal volume of 2× Laemmli buffer (33), boiled, and separated on standard SDS-PAGE. Proteins were then transferred onto nitrocellulose membranes (Protran; Schleicher & Schuell, Milan, Italy). Nonspecific binding sites were blocked by incubating the membranes in PBS containing 5% nonfat dry milk and 0.05% Tween 20. Immunodetection was accomplished by incubating the membranes first with primary Abs (1 μg/ml) and then with HRP-conjugated secondary Abs directed against mouse IgG or rabbit IgG (1/5000 dilution; Amersham, Lifescience, Milan, Italy) diluted in PBS (pH 7.4), containing 1% dry nonfat milk, 1% BSA (Sigma), and 0.1% Tween 20. The immunocomplexes were then detected by chemiluminescence (SuperSignal; West Dura Extended Duration Substrate; Pierce, Milan, Italy). Expression and phosphorylation of retinoblastoma (Rb) were analyzed by 6% SDS-PAGE as described (15). The following Abs were used: cyclin D3 (C-16), p27Kip (C-19), p21Cip (F-5), and Rb (C-15) Ab (Santa Cruz Biotechnology, Milan, Italy). T cells were stimulated as indicated in the figures, washed with PBS, counted, and fixed overnight at 4°C in 70% ethanol. Cells were then pelleted; resuspended (1 × 106 cells/ml) in DNA staining buffer containing 0.1% sodium citrate, 0.05% Nonidet P-40, 50 μg/ml propidium iodide, and 50 μg/ml RNase A (Sigma); and incubated for at least 1 h at room temperature. PI contents were assessed by flow cytometry (FACScan; BD Biosciences, Milan, Italy) using standard CellQuest (BD Biosciences) acquisition/analysis. T cells were washed twice with PBS and resuspended at a density of 2 × 107 cells per ml in PBS. An equal volume of 5 μM carboxyfluorescein diacetate succinimidyl ester (Molecular Probes., Milan, Italy) in PBS was added, and the cells were gently mixed for 8 min at room temperature. Unbound carboxyfluorescein diacetate succinimidyl ester, or the deacetylated form, CFSE, was quenched by the addition of an equal volume of FBS. The labeled cells were washed twice in complete medium and stimulated as indicated in the figures. At the time of harvest, CFSE-labeled cells were washed twice in PBS, and the vital dye TO-PRO-3 (Molecular Probes) was added to each sample (1 nM final concentration) before acquisition to distinguish live and dead cells. Cell division analysis was performed on a BD Biosciences FACSCalibur dual-laser cytometer using standard CellQuest acquisition/analysis. If not differently indicated, cells were harvested and analyzed 5 days after CFSE labeling and 15,000 events were collected. CFSE labeling remained stable for up to 3 wk in our cell cultures. Because TCR- and CD28-generated signaling can mediate the G1-to-S phase transition via IL-2-independent mechanisms (24, 27, 28), we investigated whether a combination of anti-CD3 and anti-CD28 mAbs would overcome the G1 cell cycle block reported for anergic T cells and by that cause reversal of clonal anergy. T cell anergy was induced in cloned CD4+ Th lymphocytes by chronic TCR engagement in the absence of costimulation as previously described (8). Briefly, nonproliferating A.E7 T cells were harvested and rested in fresh medium (referred to as control T cells) or cultured for 16 h on plate-bound anti-CD3 mAb, removed from the Ab, and rested for an additional 5 days in fresh medium (referred to as anergic T cells) (Fig. 1⇓A). At the end of the resting time, control and anergic T cells appeared to be in the G0-G1 phase of the cell cycle (refer to Figs. 2⇓ and 3⇓). In addition, control and anergic cells expressed similar surface levels of the TCR (Vβ3: mean fluorescence intensity, 41.66 ± 0.34 vs 41.35 ± 0.12), of CD3 (27.01 ± 1.39 vs 23.83 ± 3.66; see also Ref. 34), and of CD25 (23.87 ± 0.07 vs 26.54 ± 0.17). Chronic TCR engagement results in the establishment of T cell clonal anergy. A, Schematic representation of anergy induction. Resting A.E7 cells were either left untreated (control cell) or cultured for 16 h on plate-bound anti-CD3 mAb (anergic cells). Thereafter, the cells were rested in fresh medium for 5 days and restimulated as indicated. B, Control (CT) and CD3-treated cells (anergic (AN)) were challenged with irradiated splenic APC and the indicated amount of the PCC-derived peptide, with immobilized anti-CD3/anti-CD28 mAbs (2 and 5 μg/ml, respectively), or with rIL-2 (10 IU/ml). After 48 h, [3H]thymidine was added to each well, and the cells were harvested and assayed for proliferation after an additional 16 h of culture. C, IL-2 production was measured in the supernatants of CD3/CD28-stimulated T cells after 24 h of culture by capture ELISA. The SDs of triplicate cultures are reported. Values reflect one of several (more than five) independent similar experiments. Regulation of G1 cell cycle proteins in control (CT) and anergic (AN) T cells on Ag/APC- or CD3/CD28 mAbs-mediated activation. T cell anergy was induced as described in Fig. 1⇑. 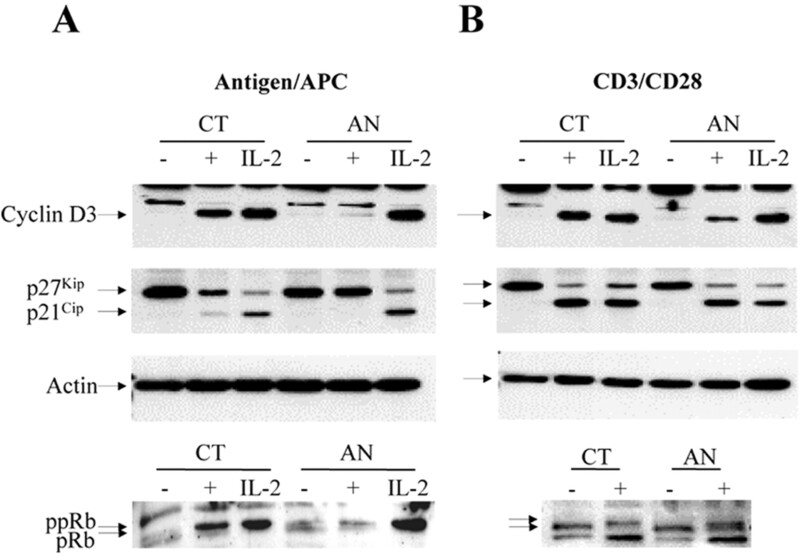 Control and anergic T cells were stimulated with either Ag/APC (A) or anti-CD3/CD28 mAbs (B) for 24 h. Thereafter, the cells were lysed, and protein content was analyzed by SDS-PAGE and Western blot analysis with the Abs as indicated. p27Kip and p21Cip were detected on the same membrane filter by sequential hybridization. The arrows indicate the relative mobility of the proteins. CD3/CD28-mediated stimulation of anergic T cells bypasses G1 cell cycle block and results in G1-to-S cell cycle progression. T cell anergy was induced as described in Fig. 1⇑. 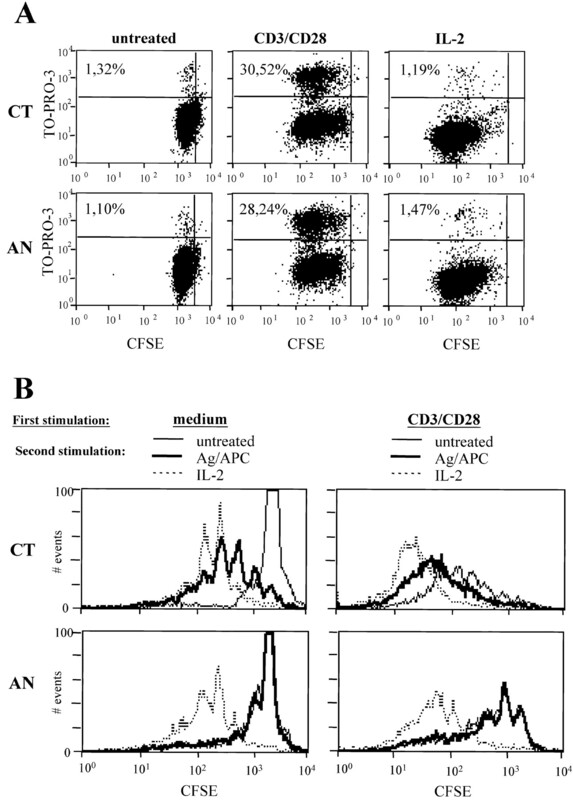 Control (CT) and anergic (AN) T cells were then stimulated with either Ag/APC (A) or with anti-CD3/CD28 mAbs (B) for 48 h. Thereafter, the cells were counted, fixed, stained with propidium iodide, and analyzed by flow cytometry. Representative FACS histograms of the DNA content of unstimulated (untreated or stimulated with APC only), Ag/APC-stimulated, and CD3/CD28-stimulated control and anergic T cells are reported. C, Percentage of cells in the S-G2-M phase (DNA content >1N) in resting (untr.) and stimulated (Ag/APC, CD3/CD28) control (□) and anergic (▪) T cells calculated in four independent experiments (mean ± SD). 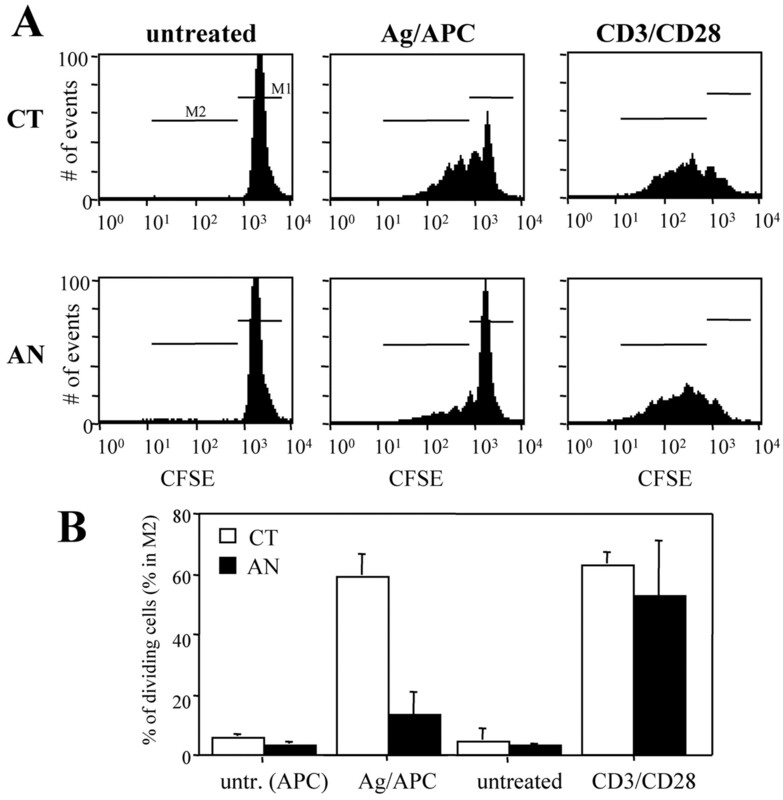 Control and CD3-treated anergic T cells were thus restimulated with either Ag-pulsed APCs (Ag/APC) or with a combination of anti-CD3 and anti-CD28 mAbs. Proliferation and IL-2 secretion were then measured by [3H]thymidine incorporation and by capture ELISA, respectively. On Ag rechallenge, anergic A.E7 T cells proliferated to much lower extents than control T cells (Fig. 1⇑B) and showed defective IL-2 production even in response to optimal TCR and CD28 engagement (Fig. 1⇑C), as previously described (8, 34). Interestingly, despite the failure to produce IL-2, control and anergic T cells produced comparable amounts of IFN-γ (not shown) and proliferated to similar extents in response to immobilized anti-CD3/CD28 mAbs (Fig. 1⇑B). This last observation prompted us to investigate whether the G1-to-S transition could be differentially regulated after Ag/APC- or CD3/CD28-mediated restimulation of anergic T cells. We first analyzed the expression of G1 cell cycle proteins by Western blot (Fig. 2⇑). Although Ag-dependent stimulation of control cells resulted in the up-regulation of cyclin D3 and of p21Cip, in the hyperphosphorylation of Rb, and in the down-regulation of p27Kip levels (Fig. 2⇑A), it failed to induce G1-related events in anergic T cells. Thus, as also reported elsewhere (11, 16), anergic T cells are unable to progress through the G1 cell cycle checkpoint upon Ag/APC encounter. In contrast, stimulation with anti-CD3/CD28 mAbs elicited similar up-regulation of cyclin D3 and of p21Cip, hyperphosphorylation of Rb and down-regulation of p27Kip (Fig. 2⇑B) in both control and anergic T cells. This indicates that optimal TCR/CD28 engagement elicits proper regulation of the G1 cell cycle proteins and entry of anergic cells in the S phase. To determine the fraction of anergic T cells able to proceed from G1 to S-G2-M after CD3/CD28-mediated stimulation, we measured DNA contents by propidium iodide staining. This technique allows one to discriminate cells in G0-G1, recognized by a typical DNA content equal to 1N, from cells in S-G2-M which have a DNA content >1N (2N for cells in the M phase). Preliminary experiments indicated that by 48 h of stimulation, 20–40% of stimulated A.E7 T cells had a DNA content greater than 1N, suggesting that by this time the cells had entered the S-G2-M phase (data not shown and Fig. 3⇑). Control and anergic T cells were therefore stimulated with either Ag/APC or immobilized anti-CD3/CD28 mAbs for 48 h, fixed, stained with PI, and analyzed by flow cytometry. As expected, whereas control cells increased their DNA content upon Ag/APC-stimulation, anergic T cells failed to do so (Fig. 3⇑A). In contrast, upon CD3/CD28 stimulation, both control and anergic cells had a sizable fraction of cells with a DNA content >1N, and thus in S-G2-M (23.83 ± 3.92% and 34.89 ± 5.68%, respectively; Fig. 3⇑B). After 48 h of stimulation, no differences were detected in the total number of live cells or in the fraction of the cells with DNA content <1N (subG1, apoptotic cells), suggesting that anergic T cells were not preferentially dying in our cell culture conditions (not shown). To demonstrate that CD3/CD28-mediated stimulation could promote cell proliferation, we labeled the cells with the fluorescent dye CFSE. This dye passively diffuses into the cells, it is retained at the cell surface, and it segregates equally between daughter cells upon cell division, resulting in the sequential halving of cellular fluorescence intensity with each successive generation and allowing one to trace the fate of single cells by flow cytometry. Thus, control and anergic T cells were labeled with CFSE, stimulated with Ag/APC and anti-CD3/CD28 mAbs, and analyzed 5 days later by flow cytometry. Whereas only control cells divided on Ag/APC-mediated stimulation, both control and anergic T cells completed several cycles of cell division upon CD3/CD28-mediated stimulation (Fig. 4⇓). 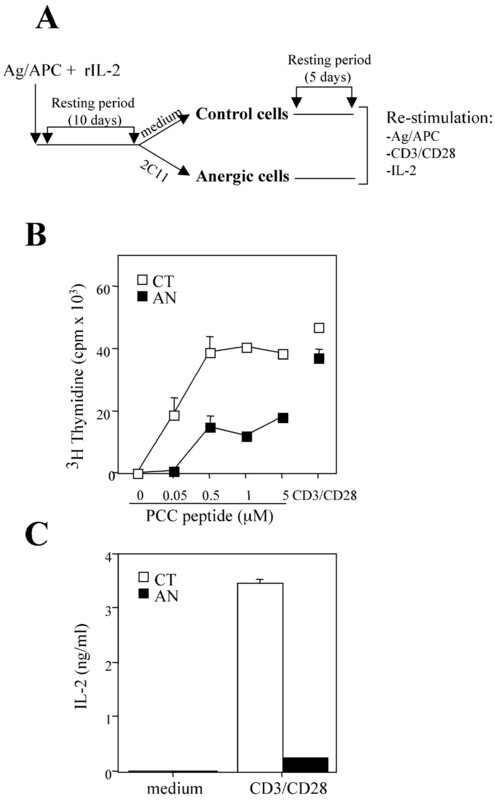 Interestingly, a comparable fraction of control and anergic cells proliferated on immobilized anti-CD3/CD28 mAbs, despite the fact that IL-2 was undetectable in culture supernatants of anergic T cells. CD3/CD28-mediated stimulation drives comparable proliferation of control and anergic A.E7 cells. T cell anergy was induced as described in Fig. 1⇑. Control (CT) and anergic (AN) T cells were then labeled with the fluorescent dye CFSE and left untreated (untr.) or stimulated with Ag-pulsed irradiated splenocytes (Ag/APC) or with anti-CD3/CD28 mAbs for 5 days and then analyzed by flow cytometry. A, Representative FACS histograms reporting the degree of CFSE dilution are shown. B, Percentage of control and anergic T cells that divided more than once (and thus fell in the indicated M2 gate) calculated in four independent experiments (mean ± SD). Altogether, these results suggest that optimal cross-linking of the TCR and of the CD28-costimulatory receptor overcomes the G1 cell cycle block and drives anergic T cell proliferation. To better define whether anti-CD3/CD28 mAbs could drive G1-to-S transition and cell proliferation in the absence of IL-2, we generated a T cell line from the DO11.10 TCR-transgenic IL-2-deficient mice (22) and analyzed the ability of these cells to respond to CD3/CD28 stimulation. Wild-type and IL-2−/− T cells were stimulated with immobilized anti-CD3 and anti-CD28 mAbs for 48 h. Thereafter, the cells were harvested and lysed, and protein contents were analyzed by Western blot. After stimulation, up-regulation of cyclin D3 and of p21Cip and down-regulation of p27Kip were detected in both cell types (Fig. 5⇓A), suggesting that optimal TCR/CD28 engagement can regulate the G1 cell cycle proteins in the absence of autocrine IL-2. Interestingly, cyclin D3 up-regulation was less pronounced in both anergic (Fig. 2⇑B) and IL-2−/− (Fig. 5⇓A) T cells than in the control and wild-type population. This could be due to the fact that activation of both anergic and IL-2−/− T occurs in the absence of IL-2, which has been shown to elicit and sustain cyclin D3 expression (26, 35). CD3/CD28 engagement regulates the G1 cell cycle proteins and elicits proliferation of IL-2 −/− T cells. A, Wild-type (WT) and IL-2−/− DO11.10 T cells were either left untreated (−) or stimulated with immobilized anti-CD3 and anti-CD28 mAbs (0.1 and 5 μg/ml, respectively) for the indicated times. Western blot analysis of total cell lysates were then performed with the Abs as indicated. p27Kip and p21Cip were detected on the same membrane filter by sequential hybridization. B, IL-2−/− DO11.10 T cells were labeled with the fluorescent dye CFSE and either left untreated (thin line) or stimulated with anti-CD3/CD28 mAbs (CD3/CD28) or suboptimal anti-CD3 mAb and rIL-2 (IL-2) for 5 days and then analyzed by flow cytometry. Representative FACS histograms reporting the degree of CFSE dilution are shown. We next asked whether anti-CD3/CD28 mAbs could drive complete cell cycle progression and elicit cell division in the absence of IL-2. 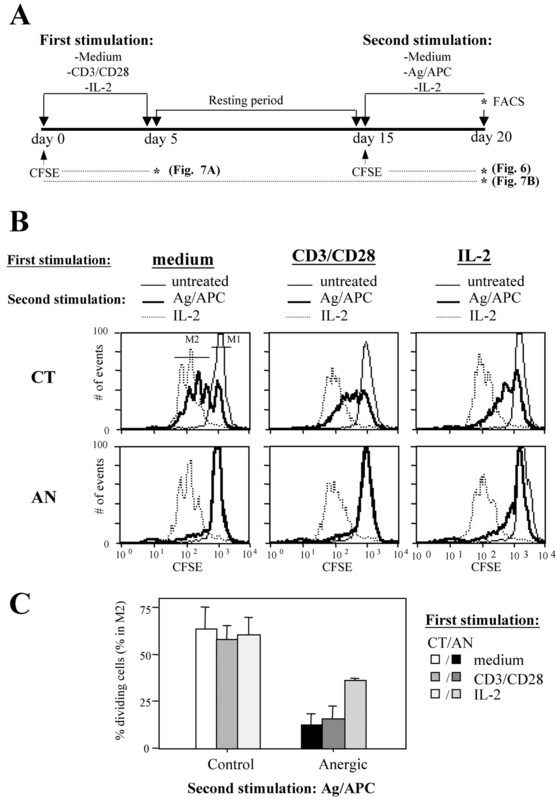 To this aim, wild-type and IL-2−/− T cells were labeled with CFSE, stimulated with immobilized anti-CD3/CD28 mAbs, and analyzed by flow cytometry 5 days later (Fig. 5⇑B). As control, T cells were stimulated with rIL-2 normally used to propagate this clone in culture. Results show that similarly to wild-type T cells (not shown), IL-2−/− DO11.10 T cells completed several rounds of cell division as detected by serial CFSE dilution during CD3/CD28- and IL-2-mediated stimulation. Together, these results support the idea that CD3/CD28 can regulate cell cycle-related events and induce T cell proliferation via IL-2 independent mechanisms. Because IL-2-dependent G1-to-S transition was previously shown to prevent and reverse clonal anergy (9, 13), we next investigated whether proliferation induced by anti-CD3/CD28 mAbs could restore Ag responsiveness in anergic T cells. Control and anergic T cells were first allowed to proliferate in response to immobilized anti-CD3 and anti-CD28 mAbs or to rIL-2 (first stimulation; refer to Fig. 6⇓A for a schematic representation of the experiment). Proliferation during this time was monitored by CFSE dilution in separate samples (not shown). Thereafter, the cells were rested for 10 days, labeled with CFSE, and restimulated with Ag/APC or rIL-2. CFSE dilution in response to Ag/APC rechallenge was then used to compare Ag responsiveness in untreated, CD3/CD28-treated, and IL-2-treated cells. As expected, only untreated control cells, and not untreated anergic T cells, proliferated in response to Ag/APC and completed up to four rounds of cell division (Fig. 6⇓B, left panels). Surprisingly, similar results were obtained with cells allowed to proliferate in response to immobilized anti-CD3/CD28 mAbs (Fig. 6⇓B, middle panels). Thus, only CD3/CD28-stimulated control T cells, and not CD3/CD28-stimulated anergic cells, divided in response to Ag/APC (Fig. 6⇓, B, middle panels, and C). This indicates that despite completing several rounds of cell division, anergic T cells still fail to respond to antigenic rechallenge. Proliferation of anergic T cells induced by optimal CD3/CD28 engagement does not restore Ag responsiveness. A, Schematic representation of the experimental design. T cell anergy was induced as described in Fig. 1⇑. Control (CT) and anergic (AN) T cells were then allowed to proliferate in response to immobilized anti-CD3/CD28 mAbs for 5 days, as described in Fig. 4⇑, and rested for the next 10 days. In parallel, the cells were also stimulated with rIL-2. Thereafter, control and anergic T cells were labeled with CFSE and either left untreated or stimulated with Ag/APC or with rIL-2 (IL-2) and analyzed by flow cytometry 5 days later. B, Representative FACS histograms reporting the degree of CFSE dilution in the absence (thin line) and in the presence (thick line) of stimulation are depicted. C, Percentage (mean ± SD of three independent experiments) of control and anergic cells pretreated as indicated (first stimulation) dividing to secondary rechallenge with Ag/APC. In contrast to anergic T cells that had divided in response to immobilized mAbs, anergic T cells allowed to proliferate in response to rIL-2 regained, at least in part, the ability to respond to Ag/APC (Fig. 6⇑, B, right panels, and C). The IL-2-dependent anergy reversal was detected, although to variable extents, in several independent experiments (the average proliferative response to Ag/APC rechallenge of rIL-2-treated anergic T cells was 77.81 ± 36.42% of control cells). IL-2-driven proliferation restored the ability of anergic T cells not only to proliferate in response to an Ag rechallenge but also to produce IL-2 (data not shown). Thus, whereas the IL-2 produced by CD3/CD28-stimulated anergic cells represented only 2.5 ± 0% of the IL-2 produced by control cells, the amount of IL-2 produced by anergic T cells allowed to proliferate in response to rIL-2 was 87.5 ± 22.5% of the amount produced by control T cells. By contrast, IL-2 was never detected on restimulation of anergic T cells allowed to proliferate on immobilized anti-CD3/CD28 mAbs (not shown). Finally, all the cells proliferated to similar extents in response to rIL-2 (Fig. 6⇑B, dotted lines), indicating that untreated and CD3/CD28-stimulated anergic cells were viable in our cultures but were specifically unable to respond to Ag/APC. Despite several rounds of cell division, the total number of viable cells recovered from the cultures of CD3/CD28-stimulated control and anergic T cells was only 100–200% of the one recovered from untreated population. To exclude the possibility that CD3/CD28-activated anergic T cells could die shortly after activation and that an unresponsive population could be selected by this stimulation, cell survival was monitored by flow cytometry over time in two independent sets of experiments. In the first set of experiments, control and anergic T cells were labeled with CFSE, stimulated with anti-CD3/CD28 mAbs or rIL-2, and then stained with the fluorescent dye TO-PRO-3 at the time of the flow cytometry analysis (Fig. 7⇓A). This dye has been previously used to identify viable and dead cells in each pool of divided cells (36). Although a higher fraction of TO-PRO-3+ cells was detected in CD3/CD28-stimulated cells when compared with IL-2-stimulated cells (∼30% and ∼2%, respectively), the fraction of TO-PRO-3+ cells was similar in CD3/CD28-stimulated control and anergic cells (30.52% and 20.24%, respectively). This indicates that the majority of the cells that proliferated in response to immobilized mAbs were viable at the end of the culture and that there was no preferential loss of proliferating cells over nonresponding cells. Survival of control and anergic T cells undergoing CD3/CD28-induced stimulation. T cell anergy was induced as described in Fig. 1⇑. Thereafter, the cells were labeled with CFSE and analyzed after 5 days of stimulation (A) or rested for an additional 10 days and rechallenged as indicated (B) (refer to Fig. 6⇑A for a schematic representation of the experimental design). A, CFSE-labeled control (CT) and anergic (AN) T cells were either left untreated or allowed to proliferate in response to immobilized anti-CD3/CD28 mAbs (CD3/CD28) or rIL-2 (IL-2) for 5 days. Just before the analysis, TO-PRO-3 was added to each sample. Representative dot plots reporting the degree of CFSE dilution (proliferation) and TO-PRO-3 staining (cell death) are depicted. B, Control and anergic T cells were labeled with CFSE and cultured for 5 days in fresh medium (left panels) or on anti-CD3/CD28 mAbs-coated plates (CD3/CD28, right panels). Thereafter the cells were rested for 10 days and either left untreated (thin lines) or restimulated with Ag/APC (thick lines) or rIL-2 (dotted lines). Representative FACS histograms of one of two similar experiments (performed with duplicates) are shown. The overlays demonstrate that the cells, which proliferated during the first stimulation, are still able to divide on rechallenge, as indicated by further dilution of their CFSE content. In a second set of experiments, control and anergic T cells were labeled with CFSE, rested in fresh medium, or allowed to proliferate on immobilized anti-CD3/CD28 mAbs and then restimulated with either Ag/APC or rIL-2. Further dilution of the CFSE content during the second stimulation allows measuring Ag responsiveness of the cells that proliferated during the first stimulation. As shown above (Fig. 6⇑), whereas control cells proliferated to Ag/APC and to rIL-2, anergic T cells failed to respond to Ag/APC and instead proliferated to rIL-2 (Fig. 7⇑B, left panels). As also shown above, whereas both control and anergic T cells proliferated in response to CD3/CD28 during the first stimulation (Fig. 7⇑B, right panels, thin lines), only control cells, and not anergic cells, further diluted their CFSE contents on Ag/APC restimulation (Fig. 7⇑B, right panels, thick lines). By contrast, all the cells further diluted their CFSE content in response to rIL-2, supporting the idea that anergic T cells, which proliferated to CD3/CD28, remain viable and able to respond to rIL-2 but incapable of responding to Ag/APC. Together, these results indicate that Ag unresponsiveness can be maintained despite several rounds of cell division and that instead an IL-2-generated signal is specifically required to obtain reversal of clonal anergy. Previous findings and our own data indicate that IL-2-generated signals are important in preventing the establishment of T cell anergy (9, 13, 37), and in restoring Ag responsiveness to already anergized T cells (Fig. 6⇑). Because the ability of IL-2 to prevent the establishment of T cell anergy was completely prevented by the addition of the immunosuppressive agent rapamycin (12), we investigated whether rapamycin would also prevent the ability of IL-2 to reverse clonal anergy. Control and anergic T cells were thus labeled with CFSE and either left untreated or stimulated with IL-2 in the absence or in the presence of rapamycin (200 nM) for 15 days (refer to Fig. 8⇓A for the experimental plan). Thereafter, the cells were collected, washed, and either left untreated or restimulated for 5 days with Ag/APCs. We first analyzed the ability of rapamycin to block IL-2-driven proliferation. Although rapamycin partially blocked control T cell division in the first 5 days of culture (Fig. 8⇓B, left panels), no differences between IL-2- and IL-2 plus rapamycin-treated cells could be observed after 20 days of culture (Fig. 8⇓B, right panels). This occurred despite the fact that rapamycin was active throughout the duration of the culture (our unpublished observation). The same result was obtained with anergic T cells (Fig. 8⇓B). Even though the inefficacy of rapamycin was initially surprising, this result is consistent with the possibility that rapamycin does not completely prevent cell cycle progression but merely delays entry into the S phase. We then compared the ability of untreated, IL-2-treated, and IL-2 plus rapamycin-treated cells to respond to Ag rechallenge. As also shown in Fig. 6⇑, whereas the majority of untreated control T cells proliferated in response to Ag/APC, only a fraction of the anergic T cells responded to the antigenic stimulation (Fig. 8⇓C, left panels). As also shown above (Fig. 6⇑), Ag unresponsiveness was lost upon IL-2-driven cell proliferation. Indeed, both control and anergic T cells stimulated for 20 days in IL-2 responded to a similar extent to Ag/APC (Fig. 8⇓C, middle panels). 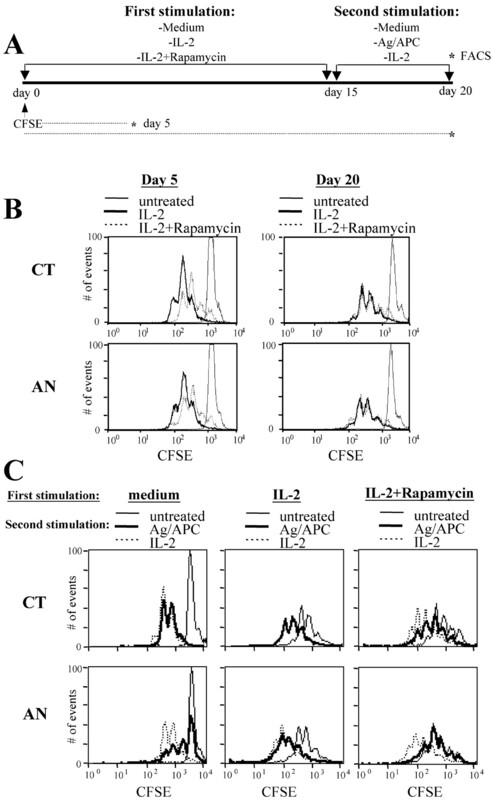 By contrast, anergic T cells stimulated with IL-2 in the presence of rapamycin failed to further dilute their CFSE content on Ag/APC rechallenge (Fig. 8⇓C, right panels). This indicates that although rapamycin does not block T cell proliferation, it completely prevents IL-2-mediated reversal of clonal anergy. Thus, altogether, our results indicate that an IL-2-induced signal, which is delivered independently of IL-2-driven proliferation is absolutely required to regulate clonal anergy and lymphocyte responsiveness. Rapamycin prevents IL-2-mediated reversal of clonal anergy, but not IL-2-driven proliferation. T cell anergy was induced as described in Fig. 1⇑. A, Schematic representation of the experimental design. B, CFSE-labeled control (CT) and anergic (AN) T cells were either left untreated (thin lines) or stimulated with rIL-2 in the absence (IL-2, thick lines) or presence (dotted line) of rapamycin (200 nM, IL-2 plus rapamycin. Cell proliferation was determined by flow cytometry after 5 (left panels) and 20 days (right panels). Representative histograms are shown. C, CFSE-labeled untreated (medium), and IL-2 or IL-2 + rapamycin-treated cells were left unstimulated (untreated; thin line) or stimulated with Ag/APC (thick line) or rIL-2 (dotted line) for 5 days. Representative FACS histograms reporting CFSE content are shown (top, middle panel, the CFSE profile obtained with rIL-2 is underneath the profile elicited by Ag/APC). The overlays demonstrate further dilution of CFSE content on secondary stimulation. A representative experiment (performed with duplicates) of three independent experiments is shown. By tracing proliferation and Ag responsiveness of single cells, we show here that proliferation and clonal anergy can be independently regulated, and although both TCR/CD28- and IL-2-generated signals elicit T cell proliferation, only IL-2/IL-2R interaction has the ability to regulate Ag responsiveness. This study originated from the observation that whereas anergic T cells fail to produce IL-2 and to properly regulate the expression of G1-related proteins, optimal engagement of TCR/CD28 is able to elicit G1-to-S transition via IL-2-independent mechanisms. We thus investigated the ability of anergic T cells to respond to plate-bound anti-CD3/CD28 mAbs. The results reported here provide a number of new important findings: 1) although Ag/APC fail to activate anergic T cells and drive G1-to-S transition, optimal occupancy of the TCR and of CD28 overcomes G1 cell cycle block and drives anergic cell proliferation; 2) CD3/CD28-dependent proliferation can occur in the absence of IL-2; 3) expression of IL-2 and G1 cell cycle proteins can be independently regulated; 4) G1-to-S-G2-M transition is not sufficient to restore Ag responsiveness; and 5) IL-2-induced signaling independently regulates cell proliferation and lymphocyte responsiveness. As previously reported elsewhere (16), we also found that antigenic stimulation of anergic T cells was unable to elicit the expression of the G1-associated proteins required for the G1-to-S transition. However, we showed that the G1 cell cycle block could be overcome by optimal engagement of the TCR and of CD28 with plate-bound anti-CD3/CD28 mAbs. Indeed, comparable levels of cyclins D2, D3, and E; of the inhibitors p21Cip and p27Kip; and of hyperphosphorylated Rb were induced in CD3/CD28-stimulated control and anergic T cells. Furthermore, comparable numbers of control and anergic T cells entered the S phase (as detected by DNA content) and completed several rounds of cell division (as detected by CFSE dilution) upon stimulation with plate-bound anti-CD3 and anti-CD28 mAbs. Several possibilities could explain why a different outcome is induced upon Ag- or Ab-mediated stimulation. It is possible that the establishment of T cell anergy lowers the sensitivity of the TCR or of CD28 and thus that more potent receptor engagement is required to elicit proper intracellular signals. In agreement with this hypothesis is the finding that soluble or latex bead-bound anti-CD3/CD28 mAbs (which provide weaker receptor cross-linking when compared with plate-bound mAbs) mediate proliferation of control, but not of anergic cells (our unpublished result). Thus, it is conceivable that whereas receptor occupancy by the Ag/MHC II complexes and the B7 family members expressed on the surface of splenic APCs only provides suboptimal receptor engagement that is insufficient to drive anergic cell activation, plate-bound anti-TCR (anti-CD3) and anti-CD28 mAbs optimally activate anergic T cells. 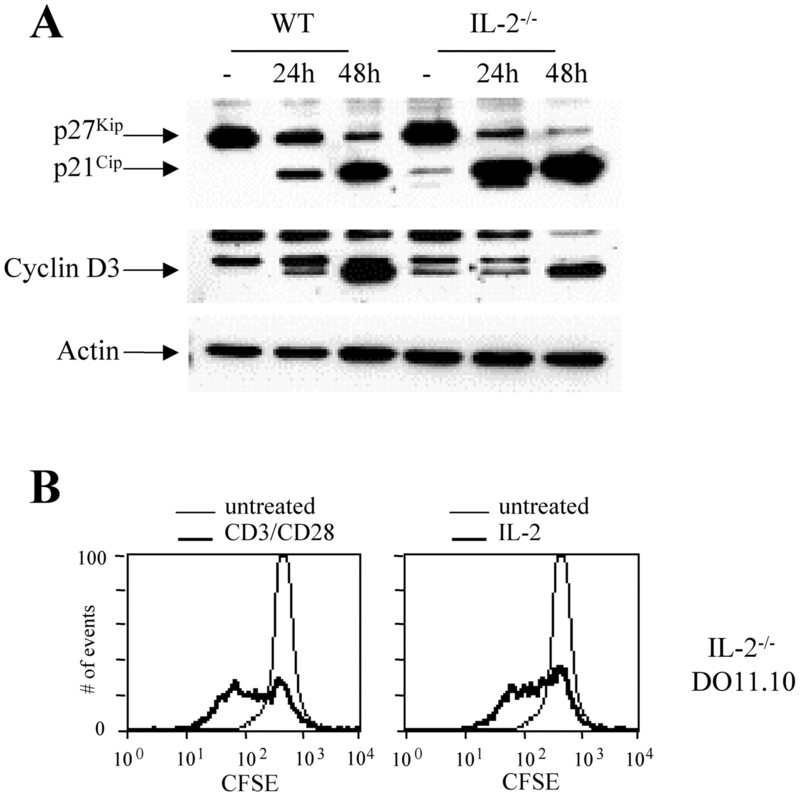 It is also possible that only anti-CD28 mAb and not the B7 molecules can activate the intracellular pathways leading to IL-2-independent p27Kip degradation, recently described in T cell clones (16) and here in IL-2 deficient T cell lines (Fig. 5⇑). Even though this possibility requires further investigation, it seems unlikely because evidences for IL-2-independent but CD28-dependent T cell proliferation has been already described in the context of Ag recognition in vivo (21, 22). Finally, it is possible that stimulation of anergic T cells with plate-bound anti-CD3/CD28 mAbs, but not with Ag-bearing APC, elicits minute amounts of IL-2, which could be sufficient to sustain clonal expansion. Even though this remains a possibility, it is interesting that the IL-2 possibly produced does not elicit reversal of clonal anergy (discussed in more detail below). The fact that plate-bound anti-CD3/CD28 mAbs drive proliferation of anergic T cells and of IL-2-deficient DO11.10 T cells, which are respectively functionally and genetically incapable of producing IL-2, suggests that CD3/CD28-dependent but IL-2 independent cell cycle progression can occur in optimally activated T lymphocytes. Appleman et al. (27) recently found that ligation of CD28 results in p27Kip ubiquitination and degradation and subsequent activation of cyclin D2-cdk4/cdk6 and of cyclin E-cdk2. In our hands CD28 ligation augmented p27Kip degradation and CFSE dilution in CD3-stimulated T cells (our unpublished data). Furthermore, CD3/CD28 stimulation elicited comparable down-regulation of p27Kip in IL-2-sufficient (control A.E7 cells, wild-type DO11.10 T cells) and IL-2-deficient (anergic A.E7 and DO11.10 IL-2−/−) T cells. Down-regulation of p27Kip in CD3/CD28-activated DO11.10 IL-2−/− T cells also correlated with cell proliferation. This was previously reported not to be the case in a recent publication by Powell et al. (38). This difference can, however, be attributed to the fact that these authors used soluble and not plate-bound anti-CD3/CD28 mAbs, and only looked at p27Kip expression early after stimulation. It is possible that either stronger receptor cross-linking or longer stimulation must be provided to elicit more complete p27Kip degradation and cell division. Thus, even though the possibility that optimal CD28 stimulation elicits production of IL-2 or of a related cytokine responsible for subsequent cell division remains to be elucidated, our results support the possibility that CD28-generated signals might directly control cell cycle progression, via an IL-2-independent mechanism. It is interesting that although maximal TCR and CD28 ligation was able to bypass the G1 cell cycle block and to elicit similar proliferation of control and anergic T cells, it failed to elicit detectable IL-2 production by anergized T cells. This suggests that the signals involved in IL-2 gene transcription and in the regulation of the G1 checkpoints might be of a different nature in our anergized Th clone. Boussiotis et al. (15) previously suggested that deregulated expression of the cyclin-dependent kinase inhibitor p27Kip, which they found overexpressed in anergic human T cell clones, correlated with defective IL-2 transcription. These authors also showed that overexpression of p27Kip inhibited IL-2 gene transcription by sequestering JAB-1 and thus inhibiting AP-1-dependent transcription. Our results do not support a role for p27Kip in defective IL-2 production in anergic A.E7 T cells. Indeed, although IL-2 was barely detectable in culture supernatants, others (38) and we (Fig. 2⇑) found p27Kip efficiently down-regulated on CD3 and CD28 engagement. Furthermore, we found JAB-1 highly represented in both the nuclear and the cytosolic fraction of control and anergic T cells (our unpublished observation), suggesting that JAB-1 is not a limiting factor for IL-2 gene transcription in anergic A.E7 T cells. Thus G1-to-S transition and transcription of the IL-2 gene seem to be independently regulated by CD3/CD28-generated signaling, because cell cycle progression occurs despite defective IL-2 synthesis. Regardless of the final mechanism that dictated CD3/CD28-dependent anergic T cell proliferation, this was not sufficient to elicit reversal of clonal anergy. This could be possibly explained if chronic TCR engagement in the absence of IL-2 could result in the continuous production and accumulation of the putative anergic factor despite cell proliferation. However, our finding that even IL-2-driven proliferation was unable to elicit reversal of clonal anergy, when occurring in the presence of rapamycin (see below), supports the idea that proliferation per se is not sufficient to restore Ag responsiveness. The idea that proper cell cycle progression and proliferation upon activation was required to maintain lymphocyte responsiveness was originally proposed by Jenkins and Schwartz (1). These authors showed that TCR engagement in the absence of costimulation elicited T cell activation but not proliferation and resulted in the establishment of clonal anergy. In this model CD28 costimulation was proposed to promote escape from anergy by eliciting IL-2 production and cell division. It was, however, later shown that proliferation was not the critical event required for escaping anergy induction but that G1-to-S transition had to occur to preserve lymphocyte responsiveness. Indeed, anergy was induced only if the cells were blocked in early G1 at the time of stimulation, but not in G0, G1b, or S-G2 phase (11, 12). Our results expand these original observations and further indicate that neither G1-to-S-G2-M phase transition nor cell division elicited by either CD3/CD28 or by IL-2 is sufficient to obtain anergy reversal. Indeed, even in the case of IL-2, we were able to dissociate T cell proliferation from anergy reversal because the addition of rapamycin failed to prevent IL-2-driven cell proliferation and instead completely prevented the ability of IL-2 to restore Ag responsiveness. A similar result was recently obtained by Vanasek et al. (39), who showed that rapamycin induced T cell tolerance in vivo despite residual T cell expansion. The inability of rapamycin to inhibit proliferation in our cultures could be explained by rapamycin merely delaying and not inhibiting cell cycle progression (compare day 5 with day 20 of Fig. 8⇑, and refer to Ref. 40) and by the existence of IL-2-dependent but rapamycin-insensitive proliferative pathways (41). Indeed, there is now evidence that IL-2-dependent proliferation is driven not only by activation of the phosphatidylinositol 3-kinase-protein kinase B/AKt-mammalian target of rapamycin (mTor) pathway but also by IL-2R β- and γ-chain-generated signals involving Bcl-2, c-Myc, and Janus kinase 3-STAT5-dependent transcription (42). It is interesting that the limited efficacy of rapamycin in blocking T cell expansion was previously underestimated by measuring proliferation by conventional [3H]thymidine incorporation (12) and was instead revealed by following division of individual CFSE-labeled T cells over time (S. Colombetti and A. Mondino, manuscript in preparation). The observation that rapamycin prevents anergy reversal suggests that an IL-2-generated, rapamycin-sensitive signal is specifically required to restore Ag responsiveness. This signal would drive clonal anergy reversal not by allowing the G1-to-S transition but rather by directly eliciting degradation or inhibition of the negative anergic factors putatively expressed on TCR engagement. At this time, it is unclear how rapamycin exerts its function. Rapamycin is known to bind the immunophilin FK506BP12, and this complex regulates the activity of mTor (43, 44, 45). mTor then leads to the activation of the p70S6 kinase (46), and to the phosphorylation of 4E-binding protein 1 (47, 48). Ongoing experiments are investigating which is the mTor-dependent signaling pathway linked to the reversal of clonal anergy. In conclusion, this study clearly dissociates cell cycle progression from the regulation of clonal anergy and reveals that the immunosuppressive effect of rapamycin is unrelated to its antiproliferative effect; rather, it is directly linked to the control of lymphocyte responsiveness. In light of these results, caution should be used in interpreting the immunosuppressive effect of rapamycin in vivo. We thank Dr. R. Pardi (DIBIT, Milan, Italy), Dr. Jon Pines (Wellcome/Cancer Research U.K. Institute), and Dr. Dan Mueller (University of Minnesota) for critical reading of the manuscript. ↵1 This work was supported by a New Unit Start Up Grant of the Associazione Italiana per la Ricerca sul Cancro (to A.M.). ↵3 Abbreviations used in this paper: PCC, pigeon cytochrome c; Ag/APC, Ag-pulsed irradiated splenocytes; mTor, mammalian target of rapamycin; Rb, retinoblastoma.